An Australian species, the Macleays Spectre Stick Insect can grow up to 150mm! Feeding on a range of food plants which can be found in your garden or in a local field, makes them easy and cheap to maintain. What does the Macleays Spectre Stick Insect look like? This is one of the larger species of stick insects that has been known to reach an adult size of 150mm. The females reach this size, but on average they reach 130mm. The females are wingless only having small buds, where as the males are fully winged and able to fly. The males are smaller than the females averaging 90 - 100mm. Both sexes can range from light to medium brown, or a greenish colour. The females have lots of sharp spikes all over the body, but the males seem to be rather smooth. The legs are lobed and these too have small projections of spikes present. Where are Macleays Spectre Stick Insects from? This species can be found in Eucalyptus forests in Australia. Although from Australia, keep this species at room temperature 20C and lightly spray water on the food plant every few days. Their native food is the Eucalyptus, but they take Bramble very well. Try and feed them the old leaves rather then the new ones, as this is what they prefer. Feeding during winter isn't a problem! How do I keep Macleays Spectre Stick Insects? 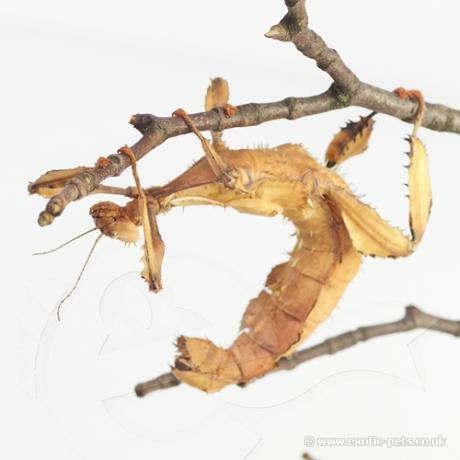 The Macleays Spectre Stick Insect is easy to keep species of stick insect. Due to this species growing so large, it's best to try and build or purchase a cage with plenty of height. Provide them with lots of food and spray every few days, more when newly hatched as they gain all the moisture they need from the plants and sprayed water. * There have been cases of sudden death, in young Nymphs. Changing the foods as often as possible, also giving them different types of foods plants, can help. Care must be taken when changing the food as the Nymphs are small and sometimes freeze and fall when disturbed. Most will get up, but some never do, this could be due to stress? Try not to interbreed this species too much as problems can arise from this. Swap and exchange stock to keep healthy sticks insects. The eggs of this species can take from 4 months if mating has been successful or up to 9 months if parthenogenesis (none mated females). Keep them at a temperature of 25C (77F) and spray every few days. Once the Nymphs have hatched keep them slightly humid but fairly warm, again around room temperature 20C (68F). You must provide them with plenty of fresh food, changing as often as possible. If you have access to Eucalyptus, then I would suggest feeding the newly hatched Nymphs on this until a little older. See problems above regarding sudden death!